Israel’s election campaign came to Washington today, with both frontrunners making high-profile appearances. Some 6,000 miles away, the Israeli military was mobilizing for an aerial offensive. Driving the news: After a rocket fired from Gaza struck a family home north of Tel Aviv early this morning, injuring seven people, Israel responded with force. The military says it struck Hamas’ public security offices and the office of the Islamist organization’s chairman, among other targets. Israel’s acting foreign minister told Channel 13 News it was the largest operation undertaken in Gaza since 2014. Hamas fired rockets in response. Back in Washington this morning, Prime Minister Benjamin Netanyahu met with President Trump before cutting his visit short in light of the attack. Benny Gantz, a former chief of staff of the Israel Defense Forces who is making a strong centrist challenge in the April 9 elections, criticized Netanyahu for the deteriorating security situation. Gantz later addressed the pro-Israel AIPAC conference in Washington, stressing his military bona fides while calling for “unity” and condemning racism and corruption. Those were thinly veiled swipes at Netanyahu, who boosted a racist fringe party in a pre-election maneuver designed to ensure a right-wing majority in the Knesset and is facing indictments in three bribery and fraud cases. Yet another scandal reared its head this week. This one concerns a submarine deal Netanyahu’s critics claim he profited from (he denies it). But while polls show Gantz’s party narrowly leading Netanyahu’s, they also show most Israelis expect Netanyahu to keep his job. 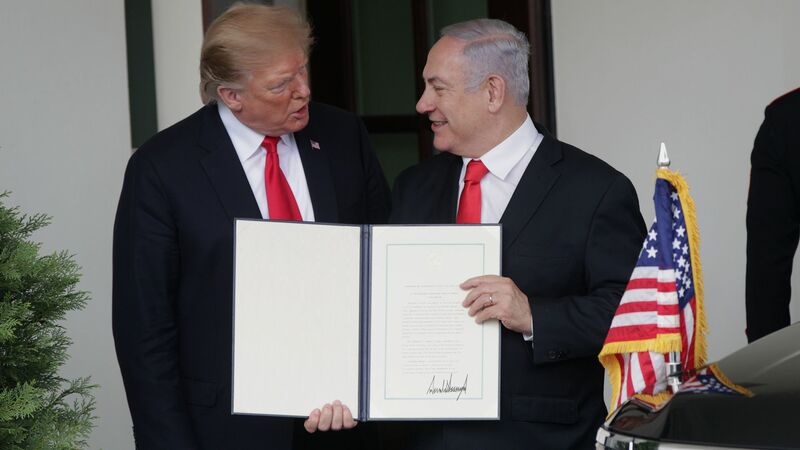 Internationally, Trump has never had a better friend than the Israeli prime minister. He has clashed with the leaders of most of America’s traditional allies. Not with Netanyahu. They’re kindred spirits. Both castigate the “fake news” media, claim to be the victims of a “witch hunt,” and paint visions of destruction and destitution should they be removed from office. Their relationship is also politically symbiotic. Trump sees political advantage in being the president who moved the U.S. embassy to Jerusalem and steadfastly defended Israel at the UN. Netanyahu, meanwhile, is placing his close ties with Trump at the center of his campaign. The bottom line: Netanyahu claims events like today's show he's the only man who can keep Israel safe, while his opponents argue they prove he's not keeping Israel safe enough. But at the heart of Israel's security lies its relationship with the U.S..
On that front, Netanyahu's case is clear. Giant billboards in Tel Aviv and Jerusalem show him smiling next to Trump along with a message: "Netanyahu, in another league."